The Red Devil cichlid, also known as the Lemon or Midas cichlid, is considered a freshwater South and Central American variety of the Cichlidae family. More specifically, it tends to call Nicaragua and Costa Rica, including the San Juan River and Lakes Masaya, Nicaragua, Apoyo, and Managua home. These beautiful but deceptively pugnacious fish easily catch the eye with their warm colors and streamlined bodies, which can grow up to 12 inches in length. Red Devil cichlids come in a wide variety of colors, depending on the region from which they originate. These color varieties include yellow, orange, blood-red and even, on rare occasions, white. Those Red Devils bought and sold in the pet trade are usually a gradient between peach and yellow, featuring a pale belly and orange-red eyes. Red Devil cichlids prefer to consume animal matter, whether freeze-dried, frozen, freshly prepared or live. That said, Red Devil cichlids will do just fine primarily subsisting on a diet of specialty pellets or tropical flakes. Treats can include bloodworms, glass worms and mature brine shrimp. In turn, Red Devils benefit from supplements that contain a highly nutritious variety of algae known as spirulina. Like most cichlids, Red Devils are aggressive, violent, often excitable fish. Aquarists interested in keeping Red Devils should realize that passive, relatively defenseless fish (or, really, anything that can fit inside the open gape of the Red Devil's mouth) are in danger of being eaten. Red Devils are least troublesome when living among other larger cichlids, especially those with shared Central and South American origins. Those aquarists looking to keep the interior design of their tanks lush and tidy might not appreciate the digging habits of Red Devil cichlids. 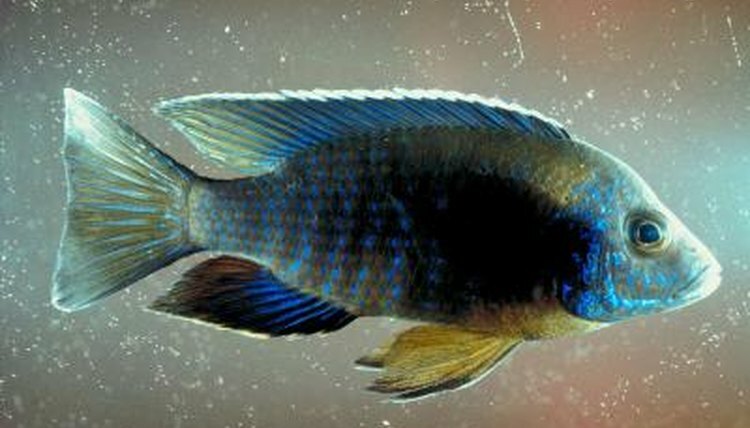 These fish are notorious for uprooting plants, which is why live plantlife is not recommended for the aquariums in which these cichlids live. Red Devils, in turn, require adequate shelter and hiding spots -- stacked stones, rocks with cavernous spaces, and even artificial root clusters.